Ahead of Wednesday’s general election, an electoral campaign characterized by populism has masked efforts to grant arbitrary powers to the government that infringe on the rule of law. 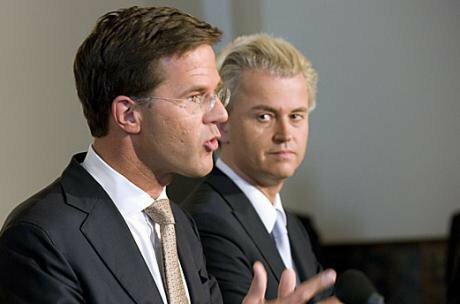 Dutch PM Mark Rutte and Geert Wilders. Dutch Government Information Service.As the Dutch election campaign, swayed by far-right leader Geert Wilders, draws to a close, parties set to gain a near-majority in parliament have made proposals threatening the rule of law: bills on denaturalisation and digital privacy that pose threats to individual rights have been approved by parliament. A report published by the Dutch Bar Association last month shows that 40 per cent of the programmes of Dutch parties contain proposals in conflict with the rule of law, fundamental human rights and the right to due process. Though election polls have been rather volatile over the last couple of weeks, three parties on the right of the political spectrum appear set to win a near-majority in parliament ahead of the election. Prime Minister Mark Rutte’s liberal People’s Party for Freedom and Democracy (VVD), the Party for Freedom (PVV), and the Christian Democratic Appeal (CDA), are set to win a total of between 60 and 72 seats. 76 seats are required to gain a majority in the 150-seat parliament. The association identified all three parties’ election programmes as making pledges at odds with the rule of law. Most of those pledges, if put into practice, would discriminate against Muslims. The PVV’s anti-Islam manifesto includes proposals to close all mosques and Islamic schools, ban the Quran, Islamic ‘expressions’ deemed at odds with ‘public order’ and headscarves in public functions, and calls for the preventive detention of ‘radical’ Muslims. The bar association deems the proposals a breach of the right of Muslims to freedom of belief, speech and education. On the other hand, the CDA seek to halt the financing of mosques and Islamic organizations from abroad. Again, the proposal has been regarded as discriminatory to Muslims as the same measures are not proposed for organisations of other religions. But proposals endangering the rule of law have also been made in areas unrelated to religion. The PVV calls for the denaturalisation and deportation of criminals with dual nationality. Similarly, the VVD wants to confiscate the Dutch nationality of citizens participating in terrorist organizations abroad, regardless of whether the person in question has received a criminal sentence. The party also wants to restrict the application of international agreements in the Netherlands. Ahead of the election, last month, the Dutch senate passed a version of the VVD’s law giving the justice and security ministry authority to strip those posing a risk to national security and joining terror organisations abroad of their Dutch nationality, without the need for a court order. A prior criminal conviction is not required either. Courts will only be informed after the person in question is denaturalised, but would then be able to overturn the decision. In practice, the law will only be applicable to dual nationals, as leaving citizens stateless through the confiscation of nationality is against international law. Thus, like Wilders’ proposal on dual national criminals, the law equates to an unequal status for dual nationals. This is a violation of the first article of the Dutch constitution, which requires that all citizens be ‘treated equally in equal circumstances’. In a letter to the Dutch government, Council of Europe Human Rights Commissioner Niels Muižnieks has said that Moroccan and Turkish nationals are more ‘likely to be, de facto, primarily affected by the bill than others,’ warning that the principle of non-discrimination should apply to those who acquired Dutch nationality by birth and those who acquired it later on. Though discussion of the law, by politicians and media alike, has focused on citizens who leave to fight in Syria – referred to as Syriëgangers in Dutch – hostility towards dual nationals is a deep-seated issue which has lain at the heart of xenophobic politics for over a decade. Figures from the Central Statistics Bureau show that of the 1.3 million Dutch citizens who are dual nationals, 50 per cent hold the Moroccan or Turkish nationality. As such, targeting dual nationals has been a key issue of interest to Wilders and his anti-Islam stance. In 2007, he accused two junior ministers of Turkish and Moroccan descent, of ‘double loyalty’ due to their dual nationalities and tabled a motion of no confidence in them. Last year, he called the Dutch parliament ‘fake’ for electing a speaker of Moroccan descent instead of the PVV candidate. Despite criticisms, the bill was voted into law by a coalition of the ruling VVD, the PVV, the CDA and two other fringe parties, while the Labour Party, part of the current coalition, had supported it in the lower chamber of parliament, but not in the senate. Wilders has praised the new law, but argued that the PVV proposal on criminality would take it a necessary step further. A second bill regulating intelligence-gathering, approved by parliament last month but pending senate approval, paves the way for further potential rights violations. The bill gives the AIVD intelligence agency the power to tap all forms of communication on the orders of or with the permission of the interior minister, subject to approval by an independent commission. The bill requires ‘serious suspicion’ that a person or an organisation poses a threat to the democratic order, security, or other state agencies. It was mostly adopted by the same parties voting in favour of the revocation of nationality, as well as the Labour Party. Unlike the current law, which only permits the tapping of a specific suspect’s online communications, the new law makes way for bulk data collection. There are serious concerns regarding the scale of data that could fall into the hands of the AIVD and could breach rights to privacy. Despite assurances that irrelevant data will be deleted, this has not been enough to convince digital privacy organisations as well as the opposition parties that voted against the bill. Both the law on the revocation of Dutch nationality and intelligence-gathering were drawn up with specific concerns about terrorism and Dutch citizens leaving the Netherlands to join militant groups in Syria, one of the key issues, alongside the European migration crisis, that has kept Wilders up in the polls for over two years. In this sense, they are the policy consequences of the rightwards shift of Dutch politics in recent times. With the volatility of its election campaign and Dutch political system based on coalitions, it is difficult to predict which parties will form a government after the election. But, looking at the polls, these issues are likely to remain very live.